Well we have news on a film called the FIRST MAN ON MARS and it is produced/directed by Mike T. Lyddon. The film stars Benjamin J. Wood, Marcelle Shaneyfelt, Sam Cobean, Kelly Murtagh, Kirk Jordan, Gavin Ferrara, Jeffrey Estiverne, Candace McAdams, Joey Harmon, Roy “Rusty” Jackson, Jr., Brian Lanigan, Tressler Burton. Below you will find the synopsis, images and the trailer that will make you want to watch this film. The countdown to terror has begun! Astronaut Eli Cologne became the first man on Mars, but something went horribly wrong. Infected by an alien organism, he returned to Earth a savage monster with an unquenchable thirst for human flesh. 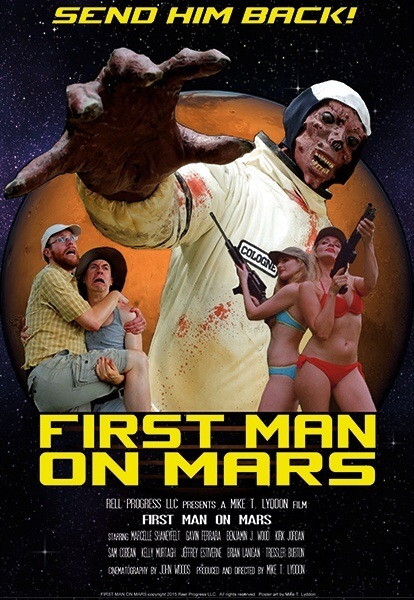 FIRST MAN ON MARS is a satire of low budget drive-in creature features from the 1970’s. First Man on MarsTrailer #1 from Reel Progress LLC on Vimeo. A Reel Progress production distributed by Tomcat Films.